It’s safe to say that while Crankworx Whistler is in session – it’s the biggest party on the planet. Mountain bikers from all over the world come to compete. Amateur mountain bikers and spectators gather to ride and attend events so they can see the best riders put it all on the line during the festival. 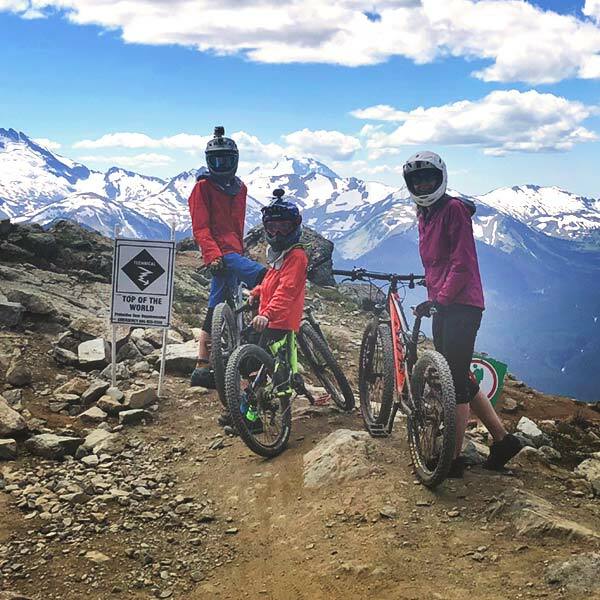 If you have never visited Whistler during Cranxworx, you must. 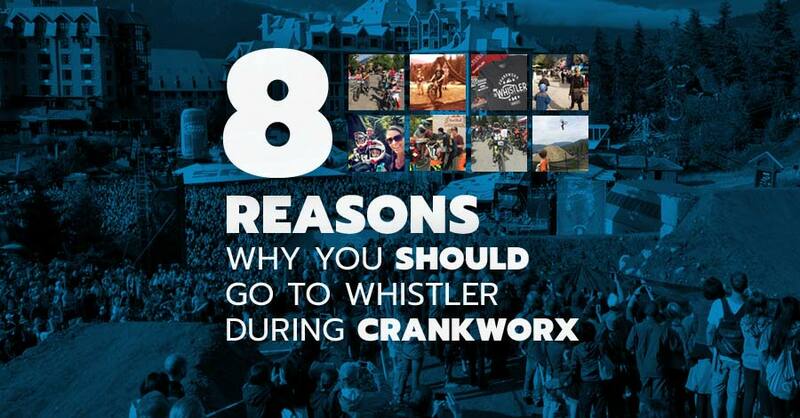 Here are our eight reasons why you should visit Whistler during Crankworx. Remember that scene in The Ten Commandments when Moses (played by Charleton Heston) makes his way down from Mt. Sinai and sees everyone partying like it’s 1999. It’s like that, but with mountain bikes. There are idols, booze, debauchery and shenanigans. Don’t worry – most of it’s family friendly. Ha ha ha. You will make memories that last a lifetime. For spectators, you get to see how big the jumps at Crabapple Hits really are when you attend the Whip-Off. The Joyride and the Pump Track Challenge courses are perennial works of art. Crankworx Whistler is also the venue for 6th leg or the 2018 Enduro World Series. For amateur participants, you can ride a lot of the same trails the pros do. 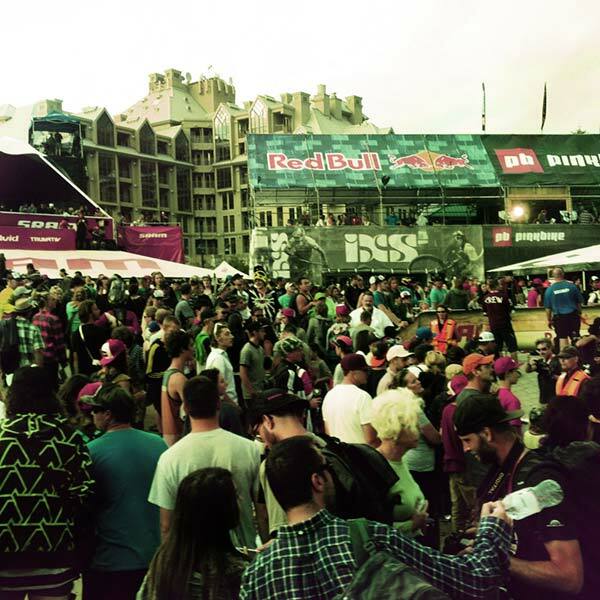 Sorry, but the Red Bull Joyride course is off-limits to the amateurs. The Ladies and Lords of mountain biking royalty assemble to compete, ooooh and ahhhh at everyone throwing down fast times and their latest slopestyle bangers. You may even catch a lift ride with one of your heroes. The Kidsworx events are absolutely wonderful. They are well-organized and geared towards nurturing the next generation of riders to flat out stomp it. 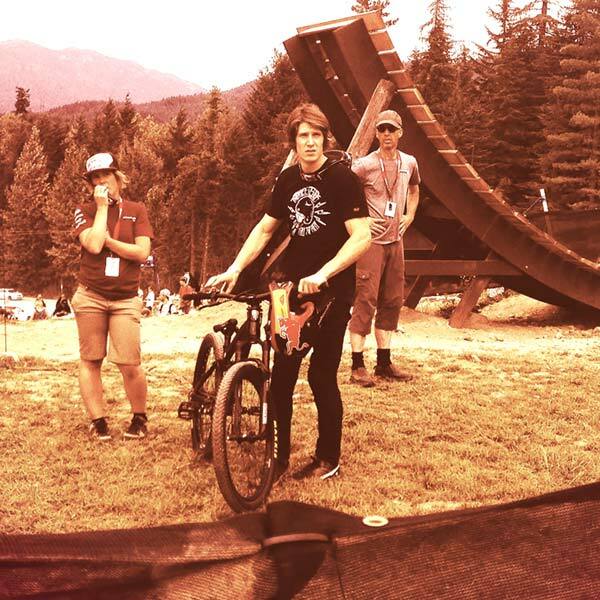 Every day at Crankworx, our kids descended upon the expos like rabid raccoons. They came away with things like hats, mini-cowbells, vuvuzelas, air-horns, decals, t-shirts, trading cards, posters, energy bars and lots of other stuff. 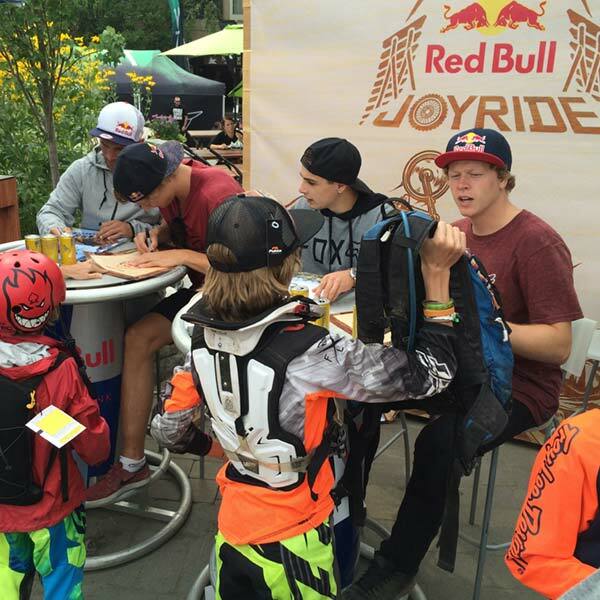 Riders will have autograph sessions promoting their latest film or brands. 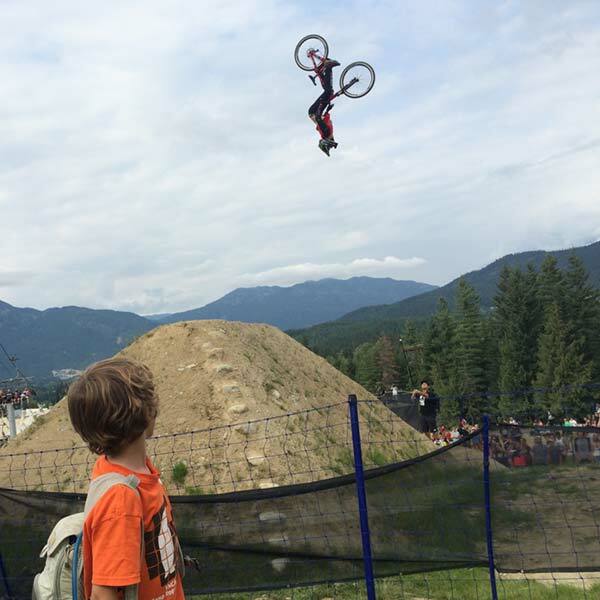 The buzz in the air at Crankworx Whistler is thick and palpable. 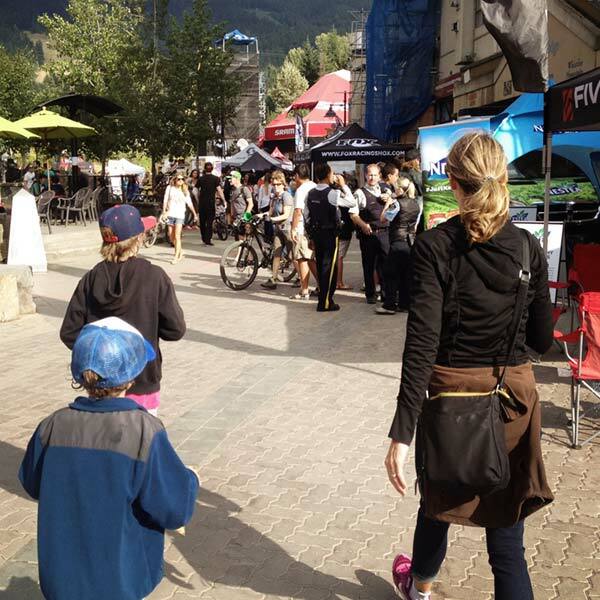 Everyone is amped to be there so they can say they were there and experience Crankworx in-person. We love strolling through the village to see everyone. If you have smaller kids aged 2 through 10-ish, be sure visit is the playground near the Whistler Olympic Plaza. While your kids run off some energy, just watch the crowd. Mountain bike manufacturers and retailers are just as excited to be there as you are. You will see the latest bikes, components, protective gear, attire, energy bars, action cameras and more. There are several drawings to enter and deals to be had. You may be able to demo a bike, fork, neck brace, and so on. 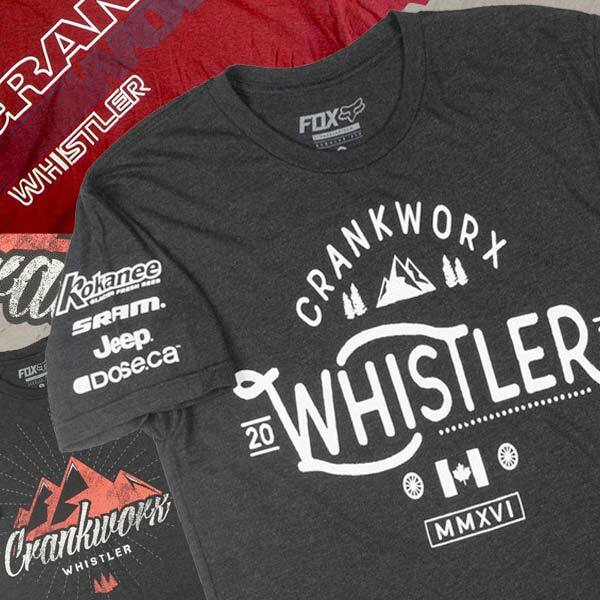 In the past, retailers have sold leftover Crankworx branded clothing and swag for up to 50% off the day after the festival ends. If you’re there the Monday after the festival, it will seem like the the day after Christmas with presents left to open. And you’ll be saying, “Did all that really happen?”. 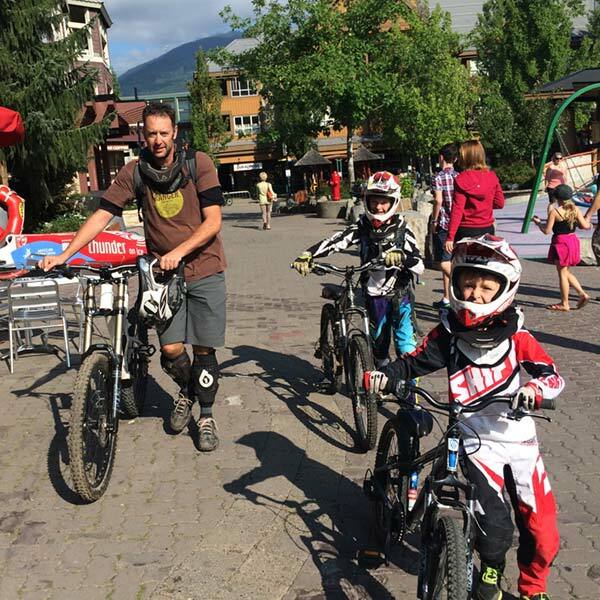 If you’re a novice or an expert; grom or grandma; riding in Whistler during Crankworx makes you a better mountain biker. It is inspiring. The trails inside the bike park and outside the park are designed to challenge you and reward you. For instance, during our family’s most recent trip, all four of us rode Top Of The World for the first time at the end of our stay. Whistler in the summer is all bikes, all the time. Your fitness is going to improve. You will be a little bit faster or you will be able to do a section of a trail you have not done before.